Harriet Nash Hurley Weds Howard Alexander Nelson Jr.
After attending McGehee’s, Harriet Hurley went to boarding school at The Shipley School in Bryn Mayr, Pennsylvania. When she came home, she had lots of boys who asked her out. Her mother wouldn’t let her go out with the same boy more than once in a week. Howard Nelson Jr. went to Princeton and he and his roommates, Hodding Carter and Jim Churchill, all had summer jobs in New Orleans. That same summer Jackeen Kelleher wanted Harriet to have a date with Howard at a dinner party at Kelleher’s parent’s home. Harriet said “yes,” and when it was time for her date three boys showed up at her door to pick her up. She didn’t know any of them, so couldn’t tell who was her date until they sat down to dinner. Howard was delightful, but didn’t call her back for three weeks, which was unheard of. He finally called and asked her out again, and on the third date he asked her to marry him. The only problem was that her mother and father expected Harriet to make her debut. After one year at Sweet Briar she came home to study at Newcomb, and Howard presented her with a ring in December while they were riding in Audubon Park. She was presented that year, and they were married that June at Trinity Church at 8 p.m. with a beautiful reception at the Hurleys’ home for about 600 guests. It was an elegant cocktail buffet with music and dancing, flowers by Rohm’s and her cake from Swiss Bakery. Harriet had her dress made at Town & Country of antique peau de soie; her cathedral length antique heirloom silk veil had been worn by generations of her family. 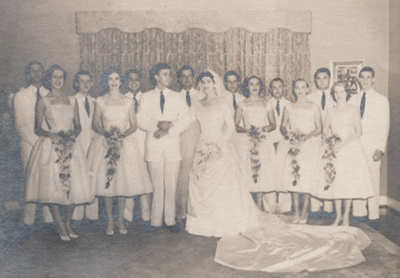 They had picked out bridesmaids’ dresses at a shop, but it burned down one week before the wedding, so Town & Country stepped in and saved the day, providing the dresses in lemon yellow organdy. The afternoon of the wedding, his groomsmen kidnapped Howard and painted him all over with gentian violet paint, which doesn’t come off for weeks. Harriet and Howard only had two days for their honeymoon, so they went to the Edgewater Beach Hotel in Mississippi. Howard couldn’t go on the beach because of the paint, but they had a ball anyway! Harriet and Howard have been married for almost 60 years and have three wonderful children.